Because it's free for everyone. Use the link on the main thread to download. I am developing my own Frontend for the gaming community (Hoping that it will be a good alternative to anyone available FE on the market at the moment). I have put the past 2 years on this one and still a year from beta release. My question: Do you know which arts I can distribute with my Frontend? Like, a set of wheel arts as a starting point? I will see what I can do for your full screen problem. Thanks, Antos. I appreciate it. Let me know if you need any additional information. I'll do some more testing as well to see if it helps to shift around the displays. Is this forum dying out? Sorry, my bad... I didn't pay attention. Have a look at the Forum stats section... more than 100k users, number of posts etc, more 100 users online at given time... according to me, this site is pretty active. Is Windows 10 Good for HyperSpin? As far I am concerned, HyperSpinHQ is crashing, even under compatibility mode. But I have'nt encountered any problems with HS itself. Shinobi donne de très bons conseils, je te lès recommande fortement. Pour ma part, tu dois t'armer de pentience, depuis 10 ans que je suis dans ce domaine, je passe plus de temps à configurer ma borne que jouer en toute franchise. Et j'aime ca, même si parfois je partage certaines des émotions destructrices que tu éprouves. :-).. À ma connaisance et n'y pas une super installation qui te permettera de tout avoir. L'important est de commencer avec ton système préféré et le bâtir selon ton propre enironnement je jeux. La bonne nouvelle est que la communauté est très généreuse. Sinon, il y a toujours l'approche commerciale avec des bornes ready to go. Bonne chance et amuse toi!! Hyper Marquee is a software to extend the display of game artworks, videos, text and HS Themes. Testers are welcome to bring comments and report bugs on the Hyperspin Web Site. Comments will certainly contribute to make this application better (some features are still very primitive). I have put a good amount of time, passion and fun developing it, and I hope that you will enjoy using it as much I enjoyed developing this. 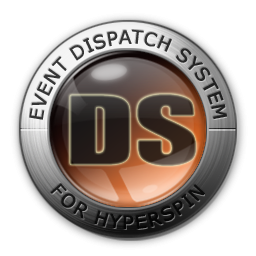 Hyper Marquee works best with (EDS) Event Dispatch System !!! MAME HQ Marquee Arts !!! Speech with Hyper Marquee (Tutorial & useful files) ******************************** DOWNLOAD: https://1drv.ms/f/s!Agk4mB5EbfOGhnPPoot0ymchQwqG ******************************** NEWS UPDATE - 2017/04/12 The version 0.4.16 is now available for download. (this is a beta evaluation version for testers only) Upgrade for new users; bug fixed, the "settings" folder was not create when starting from fresh. Ie. sadly, your settings file was not saved. Reported by Sandman7793 and Mamefan. tx. NEWS UPDATE - 2016/12/26 The beta version 0.4.15 is now available for download. (this is a beta evaluation version for testers only) Please send me your comments and impressions. (it is recommended to read the user guide first - then try, ask & comment) Short videos are available, see below. Thanks to all testers and partners! Coming soon (short video) - More details will be provided soon, this is an enhancement to support speech functionalities and text display from several sources. NB: Make sure that system users have read, write & execute access of the Hyper Marquee folder and the content (Windows setup 10 behavior). (right click on folder go to properties/security) NEWS UPDATE - 2016/06/11 The beta version 0.4.14 is now available for download. (this is a beta evaluation version for testers only) New functionalities within Beta Version 0.4.14 - Upgrade - Window can now be hidden/minimized mode for speeches and mp3. - HM now supports mp3 format. - Added the field [RandomFile] to User Text File import. Which will allow random speech and text. N.B that there is already supports for mp3, mp4 & images. Attention: Make a backup of Hyper Marquee folder (all files) before testing!! Installation: Copy and replace HyperMarquee.exe and shader.dll within your main HyperMarquee folder. NEWS UPDATE - 2016/06/01 The beta version 0.4.13 is now available for download. (this is a beta evaluation version for testers only) Please send me your comments and impressions. (it is recommended to read the user guide first - then try, ask & comment) Short videos are available, see below. Thanks to all testers and partners! New functionalities within Beta Version 0.4.13 - Upgrade ~ 2016-06-01 • New: Added Wild card [CloneOf]. • Fix: Upper case sensitivity fix with HyperList. New functionalities within Beta Version 0.4.12 - Upgrade ~ 2016-03-28 • Bug fixed when using wildcard (fields) upper case for [system]. • Bug fixed when using User Text File (load external file) with files shorter than 200 characters. • Free_Text Marquee Style has been removed from HyperMarquee for streamlining reasons. You can still use Free_Text passed by HM fifth parameter command line. Simply use the new WildCard named [FreeText] under Digital_Text Style -> Text Appearance -> Gameinfo/HyperList. NB: Previous Free_Text Style versions are not compatible with 0.4.12. New functionalities within Beta Version 0.4.11 - Upgrade (include upgrade 0.4.9 & 0.4.10) • Capability to display HighScore using Wild Card (Field) within Digital_Text (fixed text or animated text). - requested by SpotUp. • Capability to display HighScore maximum number of lines. E.g Top 3. - requested by SpotUp. • No need to specify the Named Pipe ID (under Event Tab) anymore when using the config file by default. • For artwork Images, 'Uniform Fill' will be now centered instead of displaying anchor Top Left. - Requested by MarbleMad • Bug fixed when using Digital_Text animation (Crashing in mid-scrolling for some users) New functionalities within Beta Version 0.4.8: Bug fixed when using Shaders (Now 15 Transition Shaders are back) Bug fixed when launching multiple instances with no parameters passed. New functionalities within Beta Version 0.4.7: Bug fixed when using Shaders, Bug fixed when using HyperList.xml and Increased compatibility when displaying Hyperspin themes. New functionalities within Version 0.4.4 Bug fixed for some themes that HM can't unzip. HM do not crash anymore with those. NB: These represent only a small minority of themes. New functionalities within Version 0.4.3; Improvements Now support HyperList & Game Info for all system, plus possibility to ignore text between brackets within the filename ex. (Europe) for compatibility. Enhanced Text Animation. Possibility to pause text and blink during scrolling. (delays are customisable) Possibility to split lines and make them distinct for more realistic text marquee animation. [*]For capturing events on the menu, HyperMarquee do not need HyperSpinFileWatcher anymore when using HyperSpin 1.4 beta 15 [*]Few Bugs fixed within shader, font and brush choosers. [*]Added menu item for support. Link to; Email Support Skype Support GitHub (issues reporting and enhancement wish list HyperMarquee Forum [*]Known Bugs Text Animation display when empty (need to close instead) Animated gif memory leaks Goal: To build an application that gives to Artists & Cab builders the flexibility they need to express their creativity and to Manage Displays the way they see it and want it. ---------------------------------------------- DONATION ---------------------------------------------- This is free and it will always be. To encourage development, you can send a donation of your choice. You can proceed with Paypal to; - Antos (author, conception and development - Status: Active member) https://www.paypal.com/cgi-bin/webscr?cmd=_donations&business=E7R4KGFDJ3PAU&lc=CA¤cy_code=CAD&bn=PP-DonationsBF%3abtn_donate_LG.gif%3aNonHosted. - Sevenseal (newly added member - user support, documentation, testing, research - Status: Active Member) https://www.paypal.com/cgi-bin/webscr?cmd=_s-xclick&hosted_button_id=M2ZA3T2ZZMFSE VIDEO 'How To' quick guide ------------------------------------------------------------------------ mamefan's video (setup) mamefan says "I forgot to say that you need to SAVE your configuration in Hyper Marquee before you exit. If you have any issues with Pipe (CLI) in EDS, try Pipe or CLI with CBR checked instead. I also forgot to say during the video that you can also display marquee art for other systems/consoles. If I had gone to NES games, for example, you would have seen NES game wheel art on my marquee as I scrolled through games. Whatever image you want to display will display, as long as you set it up correctly." Sevenseal's video 1 (Artwork Setup): Sevenseal's video 2 (Artwork Video Setup): ------------------------- QUICK OVERVIEW ------------------------- There are 6 possible customisable displays (styles) within Hyper Marquee. 1. Artworks: Display marquee images and videos. It supports jpeg, png, ico, anim GIF images, flv, MP4 and more. 2. Digital Text: Display a text file from a folder link or wild cards from Hyperlist/Gameinfo. 3. HyperSpin theme: Display a HyperSpin Theme. Limitation: It only supports images and videos (flv/MP4), no sounds, no animation. 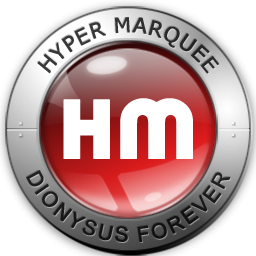 You can also create you own Marquee Themes using HyperTheme from Hyperspin. 4. Time Elapsed: Display the time elapsed of your gaming time 5. HiToText: Display some MAME game High Score. (using external HiToText app.) 6. Free Text: Display any text passed within the HyperMarquee.exe parameter (4th parameter) Some specs; - Support 1 to n individual screen display. As much as your video card and MS Windows can support. - Support any screen type of display at any resolution or format ratio. - Support 1 to n system. - Support 1 to 'infinite' images display. As much as you video card and MS Windows can support. - Support 1 to n image superposition with alpha blending for transparency. - Support text decoration. I.e Glow effect, outline effects, brushes and pixel Shaders. - Support many kinds of images and text based on GameInfo/HyperList like rating, language, game type, marquee and more. Transitions: - Fast and responsive marquee transitions on game select using Event Dispatch System (EDS) - 15 Transition shader effects using GPU (DirectX and Graphic card pipelines) for real-time pixel treatment. - Video Transition. (FLV, MP4 with transparency key) - Including HS Video Transitions Videos: - Now play Videos (FLV, MP4 & Animated gifs). All in the Artworks section and using wild cards parameters. - Video Treatments: Support Videos fast real-time treatments (17 shader effects!) - Video: DMD, Fade, Radial Blur, Ripple, Slide, Blinds, Circle, RadialWiggle and more. Text & Outlined: - Brush: Now support Font Brushes for powerful gradients ( font and outlined font) - High Score in MAME - Horizontal or vertical scrolling Images: - Background with blur shader supports - Foreground: Good for Bezel. - Artworks with shader transitions or pixel effects (see Pixel Shaders below) - Foreground: Can be used to display dynamic bezels in front of marquee image, video or games. - Background with shader supports - Image Treatments: Support Images fast real-time image treatments (17 shader effects!) Pixel Shaders: - 17 Artwork Image and Video shader effects. DMD, Telescopic Blur, ColorTone, Pinch, Pivot, Tiler, OldMovie, Pixelate and many more. Other Improvements: - Play Random files (i.e added [RandomFile] wildcard/field ). - Can play random media at start up or any random file on HS events (like image artworks, bevels, themes & videos). - Add static default background & foreground images. - Improved Hyperspin Theme compatibility. Now supporting video (flv, mp4) & sound. - Better High Score display - HM improved GUI. - Realtime DMD Display shader effect. The algorithm has been completely redesign. Develop in HLSL, this realtime shader it is now using DirectX and your GPU. -------------------------------------------------- Quick teasers -------------------------------------------------- paradoxarcades Video from Sevenseal Video from Antos Video from Sevenseal Dream machine from Griffindodd -------------------------------------------------- Some possible display - (from a 16/9 not my new 21/9). Share yours display for inspiration! (Left screen represents HyperSpin with text overlay from HyperMarquee (see 1&2 player + game rating) and right side a custom Marquee setup.) (using DotMatrixDisplay Shader and Outlined Font & Images leveraging on GameInfo & HyperList fields wild cards) Very nice Artwork from mmg1Design exploiting HyperMarquee possibilities (using font: Triple Dot Digital-7) - applying glow effect and under font from HyperMarquee internal features. Some editor capability features; Using both outlined and font text brush. Plus background image using blur shader and Text using Telescopic Blur effect. Not bad isn't? Improved Graphical User Interface using brush user friendly tool. Shader and brush can be applied to all text, image and video! High score can disappear after a certain amount of time of your choice to leave marquee artwork alone... (like any other windows) ----------------------------------------- Future Development... ----------------------------------------- - Control Panel Viewer capability within Hyper Marquee is under development right now. - Screen capture to replicate game playing on marquee - HM/EDS: Providing real-time download for missing artworks, Hyperlist & GameInfo when selecting a game. (optional feature under consideration) - Providing 3D support to display cartridges, cabinets and more should be considered next year. - EDS: Providing utilization statistics (graphs and charts) should be considered next year. - Add HM display container to avoid launching one .exe per display type.